The toys-to-life concept exploded onto the video game market seven years ago with Activision’s Skylanders: Spyro’s Adventure in 2011, ushering in an era of prosperity that would also see Disney Interactive and even LEGO get in on the action. Then, perhaps due to an oversaturation of SKUs or just a decline in interest, the scene showed signs of dying as Skylanders and Disney Infinity were cancelled. The final nail went into the coffin almost exactly a year ago with the cancellation of LEGO Dimensions in October 2017. Bulky NFC ‘portals’ would sit in the backs of cupboards collecting dust, and plastic figurines lined the pre-owned bins of game stores everywhere. Fast forward to today, and publishing and development global powerhouse Ubisoft is having a crack at resurrecting the idea with a brand new IP in Starlink: Battle for Atlas, a sci-fi flavoured open-space action adventure game where players control starships based on real-world, modular figurines. 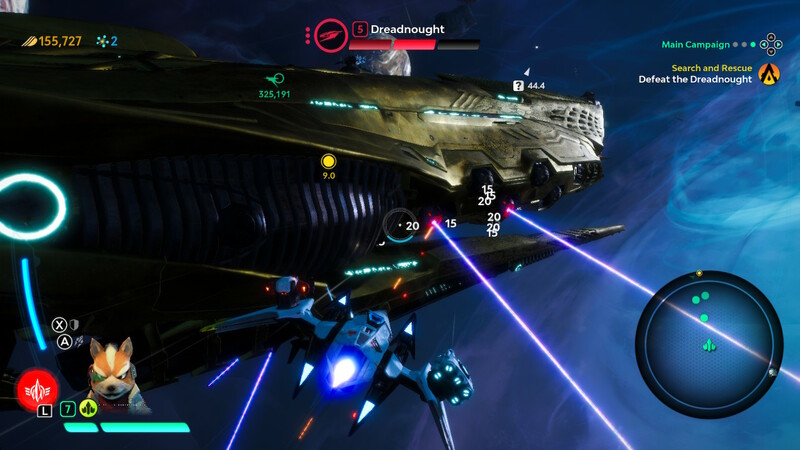 Battle for Atlas opens on the Equinox, the mothership of Starlink, a team of starship pilots and the game’s main playable characters. Before any real introductions though, things quickly go pear-shaped and a group called the Forgotten Legion ambush the crew and kidnap their leader, a man named St Grand. The Legion, it turns out, are intent on co-opting the power of the Wardens, an ancient creator-type race that St Grand happens to be conducting his own research on. Diverting from their original purpose of unlocking and studying the secrets of the Wardens, it’s up to Starlink to stop the Legion and its leader Grax from using their power to put a stranglehold on the whole Atlas star system. Told through some seriously impressive CG cutscenes, as well as an enormous amount of contextual in-game dialogue and lore-building, Starlink’s story is surprisingly decent. In playing to its intended audience it’s decidedly cheesy, Saturday morning cartoon-type stuff, but that’s never used as a crutch for lazy writing or diluted themes. Rather, the team at Ubisoft Toronto have crafted a universe that’s rich in history and ripe for exploration, as well as core team of heroes that are diverse and three-dimensional (figuratively and literally). Ubisoft have always stood out when it comes to representation in their games so it’s nice to see that trend continue here with the Starlink team’s human members, who hail from all corners of the Earth. In fact the team’s only white male is Levi, who just happens to be a not-so-subtle take on a Logan Paul type, which is entertaining in itself. Each of the game’s eleven pilots, both human and alien, exist not just as characters in-game but as real-world toys as well. By purchasing a particular Starlink pilot (more on that later) you’ll be able to play as them through the entire game, and Ubi Toronto have really gone the extra mile to make them feel like part of the story. Every character has their own unique take on story and dialogue sequences, all smartly integrated, and the game doesn’t skip a beat even when swapping between them at a whim. Then there’s the Nintendo Switch version, which ships with none other than Fox McCloud himself (as well as his famous Arwing ship). Fox (and friends!) 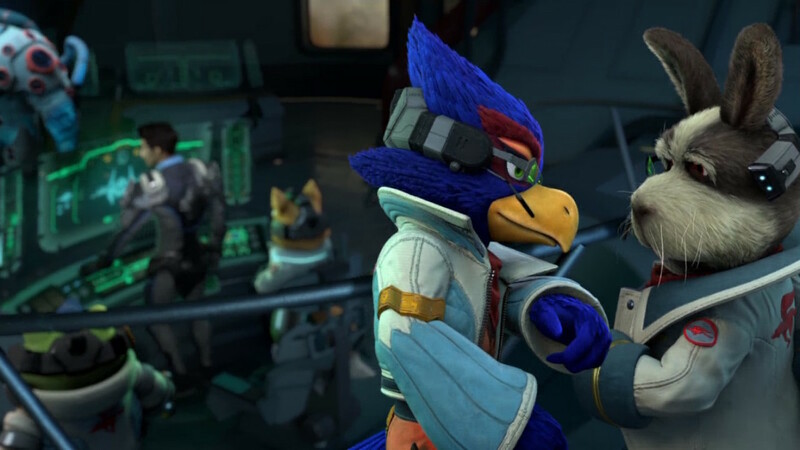 are just as neatly spliced into the game’s events, as well as getting their own side story and missions complete with classic Star Fox characters and music, making for a seriously compelling reason to play on the Switch. 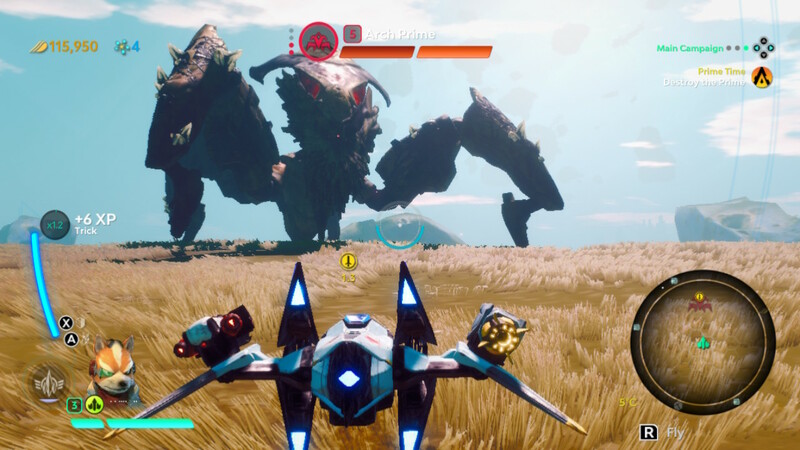 As a game, Starlink: Battle for Atlas is a heady mash-up of ideas from Ubisoft’s own properties to other, outside influences like No Man’s Sky and even a splash of Destiny. 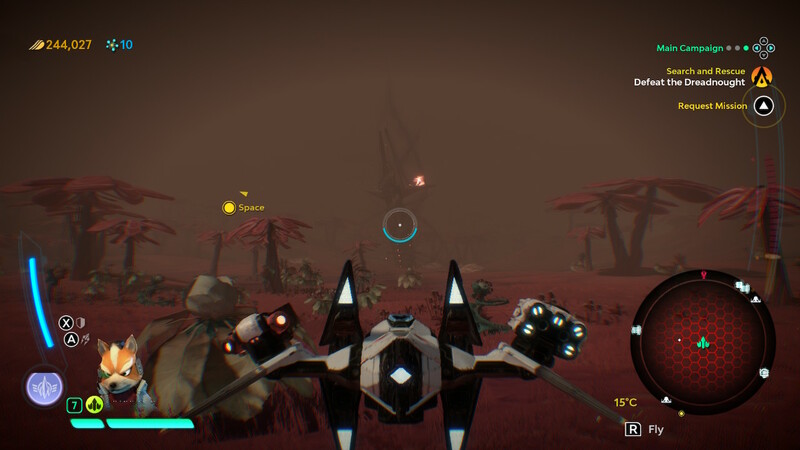 Playing strictly in control of a starship in third person, Starlink’s core gameplay loop comprises of exploring the Atlas system and its seven sizeable planets, engaging in land and space combat and managing the interests of the Alliance of the system’s races. As the Legion threat expands, each planet must be rescued from its grip by taking out its forces and bolstering the Alliance’s on-world operations. Bringing down the Legion forces works in escalation, where destroying Extractors scattered around a planet will help to locate (and weaken) a powerful enemy called a Prime, which in turn will weaken hulking space vessels called Dreadnoughts. Leave the Dreadnoughts alone too long and they’ll spawn more Primes though, and the Primes more Extractors. Alternatively, it’s possible to head straight to a Prime or even a Dreadnought and try to take it down directly, but they’ll likely pose a near-impossible threat. Combat is a simple but fast and frenetic affair, making clever use of the modular nature of its starships and their toy counterparts without ever feeling overly complex or unmanageable. Each ship can equip two weapons at a time, with available weapons categorised into various elements, which are integral to the combat and exploration experience. Enemies are often elementally imbued and thus mixing and matching the dual-wielded weapons on the fly is tantamount to surviving encounters, as is constantly being on the move and jumping or strafing away from enemy fire. Although most enemy types are repeated ad nauseum throughout the game, fighting them is enough fun that it rarely becomes tedious. This is also helped by the myriad of RPG-like customisation options available. Numerous ‘mods’ can be found, bought and crafted to augment the various ships and their parts, giving them boosted stats or extra abilities, and making it possible to create highly-specific ‘loadouts’ tailored to different situations. Pilots have their own levels too, which increase more quickly when experimenting with different ship configurations, an interesting way to encourage buying more ships. On top of fighting bad guys, you’ll also need to look after the inhabitants of each planet, spreading the influence of the Alliance by building outposts, collecting materials and studying wildlife. By increasing the survivability of the common folk and pushing back against the Legion, you’ll gain access to greater resources which in turn result in better upgrades for your ships and even the Equinox mothership. Each planet is a decently sized open world full of things to do and checklists to complete, and while most of these activities are fairly pedestrian and oftentimes repetitive in their execution, the game strings them together in such a way that it’s hard not to feel compelled to keep plugging away at a planet until you’ve got it locked down. It also helps with your efforts against the looming threat, of course. The space between planets is maybe a little less exciting, mostly playing home to the Dreadnought fights and the odd dogfight with bands of outlaws, but it’s possible to fast travel everywhere, at least. It’s quite a handsome game, too. The character and world design and CG cinematography inspire comparison to other other contemporary young adult media like the Star Wars: Clone Wars television series, while the planets and the space surrounding them have a distinct No Man’s Sky vibe. Each planet has a core visual theme, but traverse any of them and you’ll see multiple different biomes and ecosystems to boot. Voice acting and music are, again, TV-quality stuff and really solidify the whole package. The intense orchestral score swelling as you fight the imposing Legion Primes is a particular highlight. I played on the Nintendo Switch, and while I haven’t seen the PS4 and Xbox One versions in person, it’s clear some concessions were made to get the Snowdrop-powered game running on the handheld hybrid. As is par for the console, the game is still suitably impressive as a handheld experience, but falls flat mainly when playing on TV. Still, everything runs great in either configuration and the strength of the art shines above any other technical shortcomings. Of course, all of these mechanics and the game’s general successes are subject to the nature of its toys-to-life concepts, for better or worse. Anyone who’s played a toys-to-life game will immediately recognise the tropes; if your ship is destroyed you’ll either need another figure on hand or face restarting, and enemies will often be easier to take down with elemental weapons that are sold separately. Using the figures is a much nicer experience than some other games’ attempts, though. Everything is nicely detailed and constructed, especially the sizeable ship figures, and they look great sitting on the controller with the game’s proprietary mount. The fact that they sit right on the controller and not on a platform by the TV is already a big plus when it comes to switching things out, especially when the modular nature of the ships encourages doing so often. Changing weapons and even ship wings is satisfyingly tactile, and represented instantly in-game, even so far as the game recognising when weapons are placed backwards, or wings stacked on other wings, and turning those into gameplay mechanics. 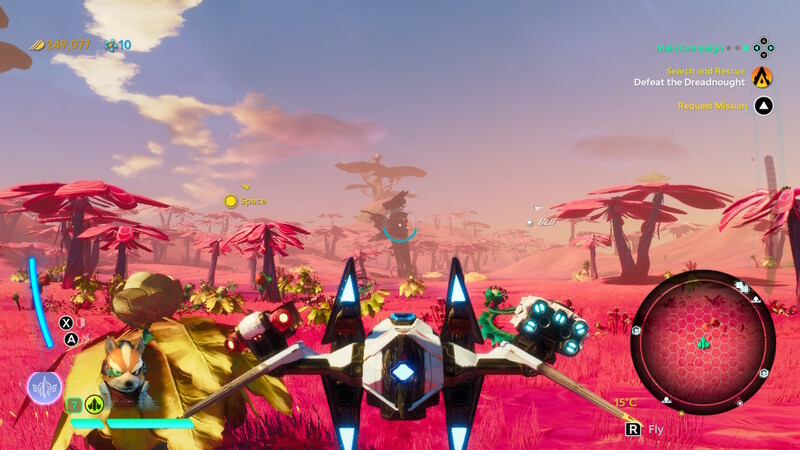 The biggest and most refreshing difference in Starlink: Battle for Atlas is that the game is perfectly playable without the figures. It’s entirely possible to acquire both the game and the extra ships, pilots and weapons either physically or digitally, and mix and match between the two. Scanning a figure into the game will also unlock that item digitally for seven days, meaning those who do enjoy collecting them don’t necessarily have to surround themselves with a pile of toys every time they want to play. The beauty of this is that Ubisoft don’t risk sinking what is a very solid game if the toy aspect doesn’t pay off, and likewise players don’t need to miss out on a great title if they’re not comfortable with spending hundreds of dollars on plastic (although they will still have to fork out for DLC to get the proper experience). Before and after using Easy-Off Bam! 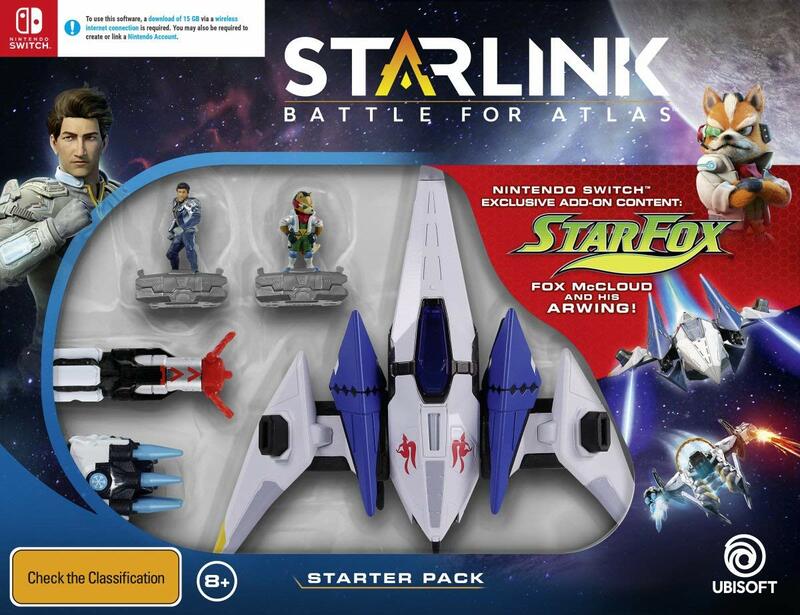 A Starlink: Battle for Atlas Starter Pack will set you back $119.95AUD (at RRP). A Starship Pack containing a new ship, pilot and weapon will run you $49.95AUD, while a Weapon Pack is $19.95AUD and single Pilot Packs are $12.95AUD. Digitally, the Starter Pack goes for $119.95AUD while the Deluxe Edition (which includes all additional ships, weapons and pilots) sells for $149.95AUD. At the time of writing we don’t have confirmation on individual digital item prices. It’s weird to celebrate a toys-to-life game for not being strictly toys-to-life, but Starlink: Battle for Atlas is such a solid game in its own right that it’s even more commendable for not forcing its collectible figures down players’ collective throats. Though its repetitive nature is a weakness, and the longevity of the concept is an unknown, the quality of the game’s world-building coupled with the sheer fun of the moment-to-moment gameplay make it a highly recommended purchase for anyone who has kids, is a kid, or wishes they were still a kid.